It seems like almost forever that Donald Trump has been in the White House. While most presidents have articles written about their first 100 days in office, Trump’s first three weeks in office is enough to fill a whole monograph. He has done more, and generated more interest, than any other leader in history. Never has a president of the United States, the world’s greatest superpower and its longest-reigning hegemon, been such a divisive force in the country. Even at the height of the US Civil War, president Abraham Lincoln was not seen as a dividing force. Citizen Trump’s metamorphosis into president-elect Trump, and then into the 45th US president on Jan 20 was not an easy road. Street demonstrations started when he was still on the campaign trail, only to get stronger as the popular vote was revealed and more recently, when controversial executive orders were signed. 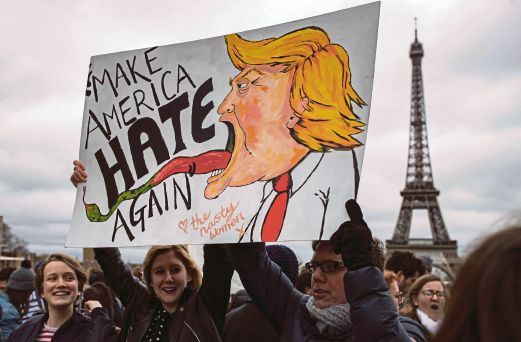 It is not only within the US that this divisiveness is prevalent; around the globe people have protested against Trump winning the White House as if that would have made a difference to US voters. Edicts issued by the president-elect sent ripples of confusion and shockwaves across the political spectrum. We only have to tune into the news of the day to see that Trump has once again managed to hog the limelight with his latest pronouncements. Street protests and backtracking edicts aside, what does this mean for international politics as a whole? The US is indisputably the global hegemon of our time. A hegemon is more than a superpower; hegemons control how and what tools we may act with, and sets the agenda for every single discussion. Throughout history, an international system where there is hegemony is always the most unstable of all systems. There is always a challenge to the hegemon; groups of states will gang up to topple the hegemon or to neutralise its overarching power over the rest of the world. Always, a hegemon is a hegemon for only a short period of time before its inevitable fall, which is why it is the most unstable of all international systems. It has always been so, except this time. Political scientists argue that the US has been an undisputed hegemon this long because it is a benevolent hegemon. It has not sought to expand its empire through annexing or conquering territory. It has not given cause for the other states to rise up against it or replace it. Its position in the international political system is unique because for more than 70 years it was a hegemon that did not victimise other states. In fact, it provided real, people-to-people assistance throughout the globe. Since the end of World War 2, the United States has instituted meaningful programmes such as the Peace Corps, and the USAID. It clung to the first tenet of progressivism — that of ethical idealism — by embracing the idea that the use of force abroad should also be for the freedom and welfare of other peoples. It dismissed the second tenet of progressivism — that of imperial foreign policy — as no longer relevant in today’s global world. As a power, the US did not need an imperial foreign policy, not when it could wield the same amount of clout with less headache, with its soft power diplomacy. The biggest economy in the world stimulated global economic growth simply by providing the mechanisms and framework through which other states might also grow and prosper. It understood that the more countries there were to trade with, the better off the US would be. It established the foundation for the rule of law to thrive and established organisations to uphold international law based on collective decisions. True, the US increased its influence and global dominance during this hegemonic period. But, US hegemony was unchallenged because it was seen as wielding its soft power for the greater good. The US was unchallenged because it was a model of benevolence. There was no reason to change the hegemon that not only made the rules, but also followed them. There was no reason to challenge a hegemon that brought abundance to so many. Until now. American politics is not just the politics of one country. It is the politics of all countries. Its rise and fall impact us all. The stability of the international political system depends on the US. This is why so much attention is paid to what Trump says and does.